Mar. 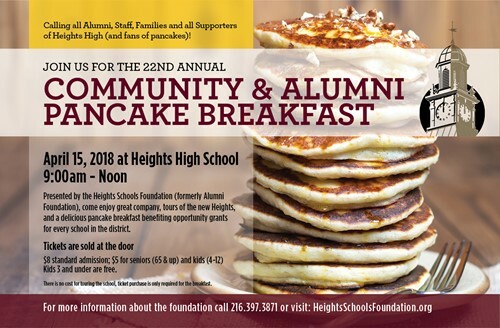 27, 2018 -- On Sunday, April 15, the community is invited to enjoy tours of the new Heights High, and a delicious pancake breakfast benefiting opportunity grants for every school in the Cleveland Heights-University Heights City School District. The annual Community and Alumni Pancake Breakfast will run from 9 a.m. until noon. Tickets, sold at the door, are $8 for standard admission, $5 for seniors (65 and older) and kids ages 4–12. Children 3 and younger are free. The event is presented by the Heights Schools Foundation (formerly the Alumni Foundation). For more information about the foundation, call 216-397-3871 or visit heightsschoolsfoundation.org.